Don’t you just love the Christmas season? I’m all for merry making and cookie baking. Well, I used to be all for cookie baking. I used to make hundreds of Christmas cookies every year. Chocolate chip, oatmeal, gingerbread, sugar cookies, thumbprints… So many cookies. I loved doing it. I would spend whole weekends doing it. Yes, you read that right, weekends. Then I had a kid. Somehow baking a zillion cookies with a toddler underfoot is a little daunting. Scratch that. Baking one batch of cookies with a toddler underfoot is a lot daunting. Remember the healthy pumpkin cookies I made? Yeah, I did that as a “fun activity” one day when the two of us were home together. She had fun. She stole chocolate chips, flung oats on the dog, dumped in mass quantities of cinnamon into the first batch of cookies, and scaled the kitchen table. It was somewhere in there when I started to rethink my Christmas cookie habit this year. But I can’t not bake at this time of year. It’s like genetically impossible for me not to. I’ve been baking Christmas cookies as long as I can remember. I probably started baking with my grandmother when I was about Goose’s age. She used to make Italian cookies dipped in icing and sprinkles. My first job baking with her was dipping the cookies in sprinkles. If I’m honest, I’m pretty sure I really was a sprinkle bandit and ate tons of them the second she turned her back kind of the way my kid sneaks chocolate chips when I’m not looking. So I decided I would in fact bake. This year instead of making millions of cookies, I’m going to make so many cookie bars like these salted caramel chocolate chip butter bars. Why? 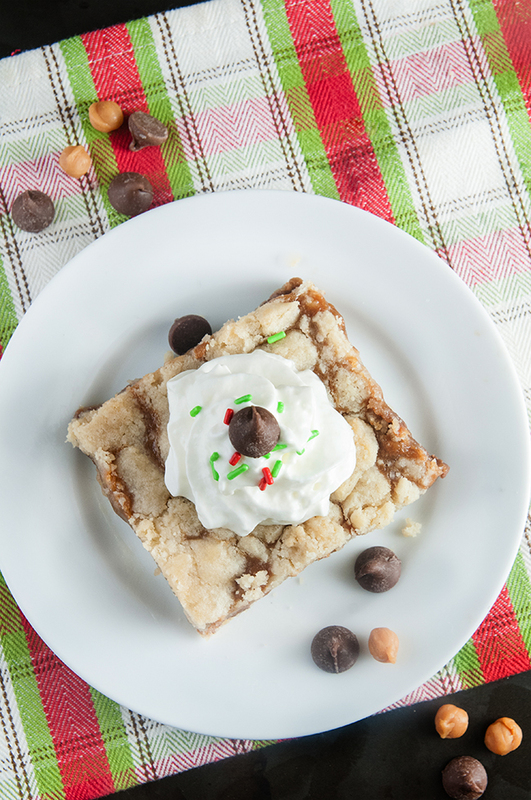 Because dumping cookie dough into a pan and baking it brownie bar style is so much easier than making cookies. Plus, let’s talk texture for a minute. 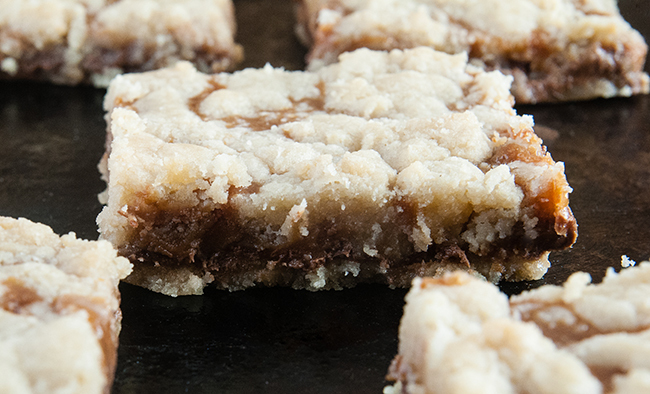 The texture of cookie bars is so perfectly chewy and…dare I say it…moist. 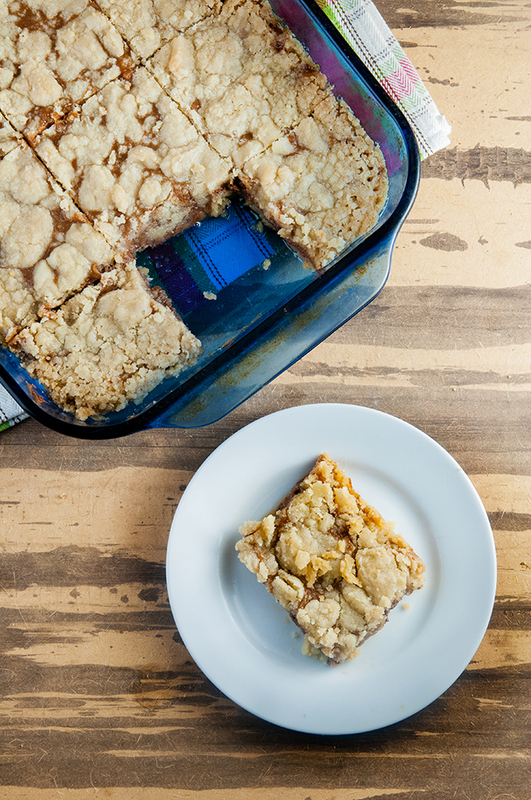 And they cookie bars practically beg you to stuff them. 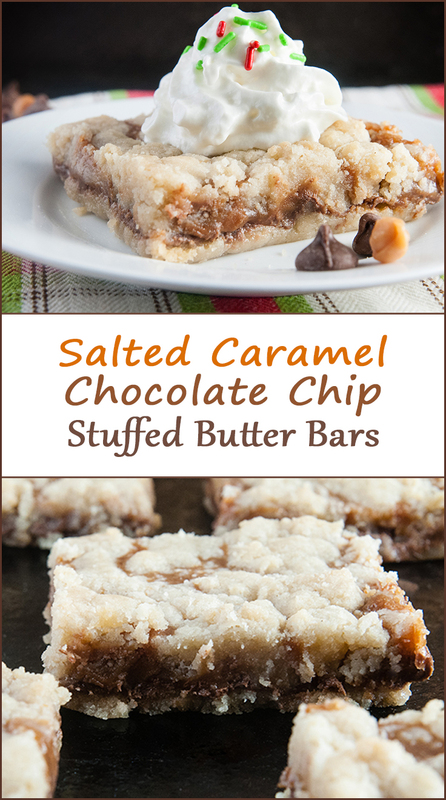 Why make chocolate chip cookie bars when you could make s’mores stuffed chocolate chip cookie bars or salted caramel chocolate chip butter bars? What’s that? 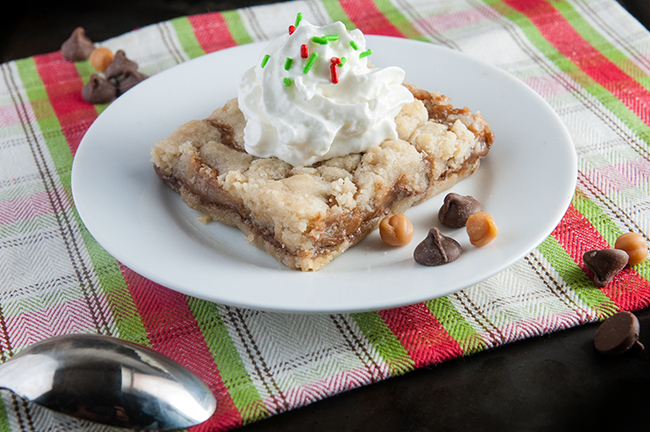 What’s a butter bar got to do with cookie bars you say? 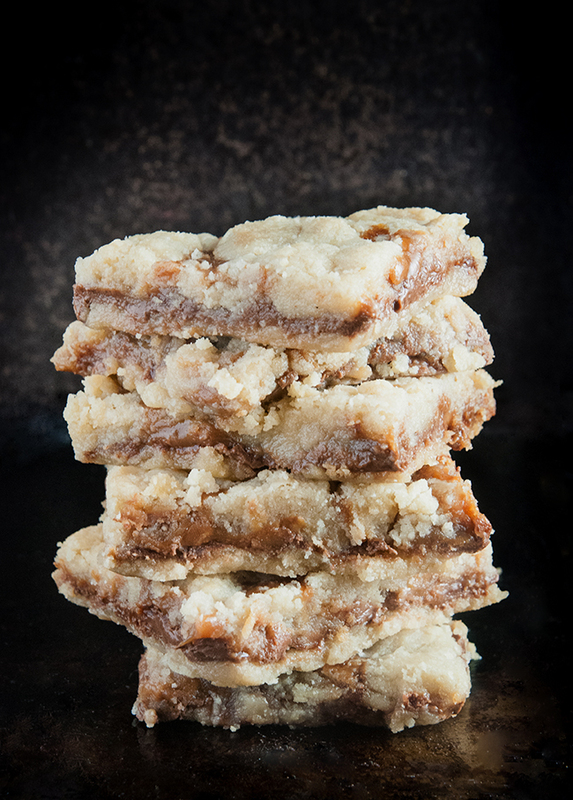 Well, a butter bar is like a cookie bar’s very butter cousin. Instead of just a stick of butter, this recipe calls for four sticks of butter. Yep four. Don’t even think about that. Calories don’t count in December. Besides, all that butter makes for a sinfully rich bar. 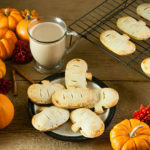 In this case the bars are stuffed with a rich mix of salted caramel and chocolate chips making them the perfect holiday treat. And though these salted caramel chocolate chip butter bars aren’t exactly what you would call health food, I did make them gluten free. I loosely followed this recipe from Cookies and Cups, and made a couple changes to make them gluten free. First, I added only 3 1/2 cups of gluten free all purpose flour instead of 4 cups of all purpose flour. 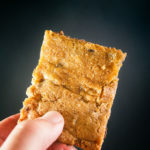 Though it’s advertised that the gluten free flour blends measure cup for cup like all purpose flour blends, I find the gluten free blends to be heavier than all purpose flour and with all the butter and toppings in these bars that could make for some unappealing bars. 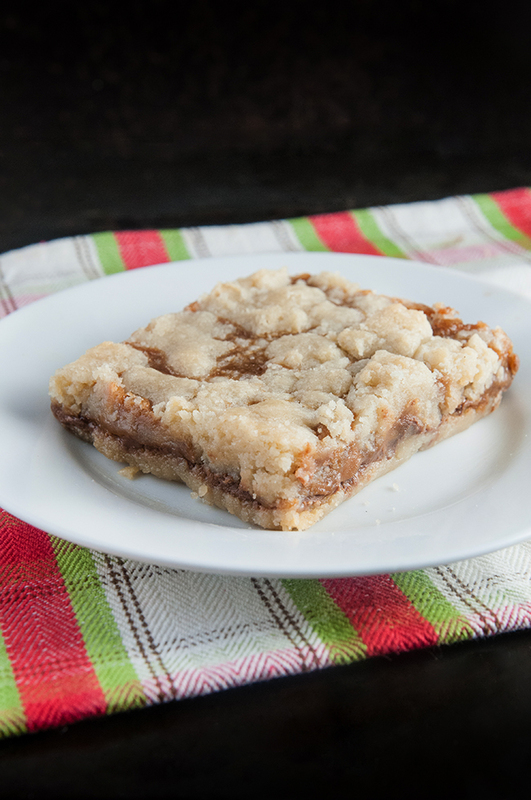 If you would like to make these bars with regular all purpose flour, just use 4 cups instead. Nothing else should change. Though I did adjust the sugar content. I wanted a slightly chewier bar with a bit of molasses background so I decreased the white sugar and added some light brown sugar instead. The result? OMG good. Possibly even better because the prep only takes a few minutes and doesn’t allow time for the toddler to wreak untold amounts of havoc on the house. If that’s not cause for merry making I don’t know what is. In a large bowl, combine the butter and sugars. Using a stand mixer on medium speed, beat together until creamy and light. Mix in the vanilla, beating until combined. Slowly add the flour into the butter mixture and beat on low speed until the dough comes together. Spray a 9×13 inch baking pan with non-stick cooking spray. Press a little less than half of the dough evenly into the bottom of the pan to form a crust. Cover remaining dough with plastic wrap and refrigerate. Bake in 325 oven for 18-22 minutes or until the crust firms and begins to lightly brown. Remove pan from oven, sprinkle on the layer of chocolate chips, return to oven for 1-2 minutes to let the chips melt. Remove from oven again and smooth the chocolate with a butter knife so it covers the whole crust layer. While the bottom crust is cooling, make the caramel filling. Pour the caramels into a microwave-safe bowl with half and half. Microwave on high for 1 minute. Remove from the microwave and stir until smooth. If caramels are not completely melted, microwave on high for 15 second intervals, stirring after each interval, until smooth. Then stir in vanilla. Pour the caramel mixture on top of the layer of chocolate. Sprinkle with coarse sea salt. 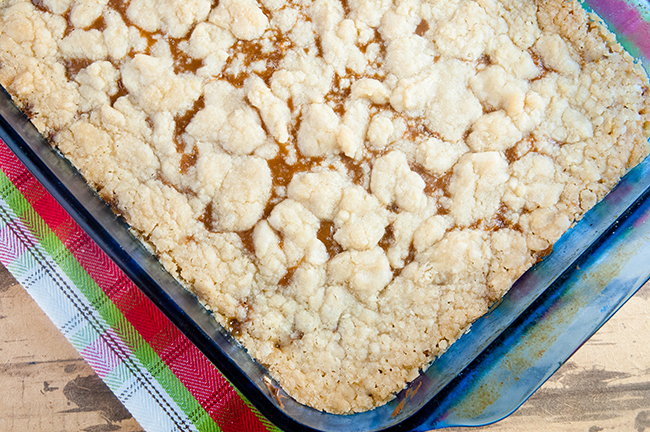 Remove the remaining chilled dough from the refrigerator and break it into even crumbles over the caramel. 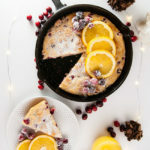 Return the pan to the oven and bake until the filling is bubbly and the topping is firm and lightly golden, about 25 – 30 minutes. These sound super yummy! I love gluten free baking! oh my goodness, these look amazing! my kids would love them! What a great holiday treat!!! These look so good. I don’t think they would last very long at my house! These look insanely delicious and like something I could actually make! Um, these sound amazing! It’s like all my favorite things in 1! Yum! oh my gosh this looks like heaven!!!! Seriously. I’m pretty sure heaven is one big butter bar. Sounds right, right? My hubby and I love caramel! These look and sound so flippin’ amazing! I’ve already pinned but just had to tell you, yum!! Those look amazing. Can’t wait to try these out this weekend! 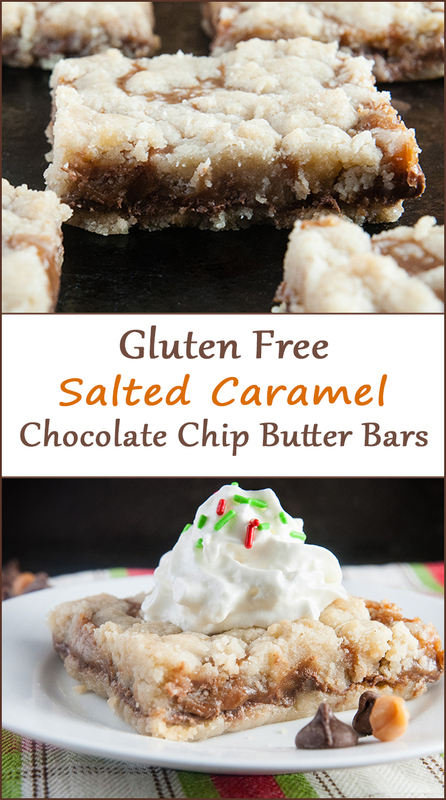 Gluten free salted Carmel choc chip butter bars?! Omg! They look delish. Hope I can make them just as good. 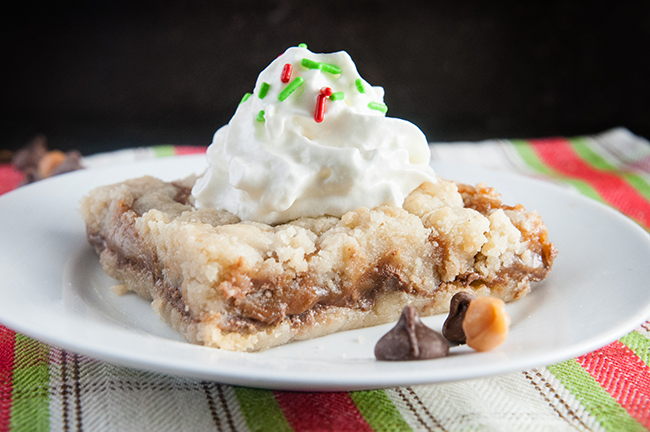 This is a fab recipe for the holidays. Giving it a GO! Yay! Jessica, it was so easy! Like no baking skills required. Hope you enjoy them! I love these bars and want to try it soon!!! Mmmm looks so delicious!! 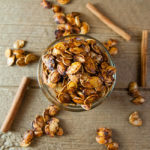 These bar look delicous–need to try the recipe ASAP! I so can not wait to try these! I myself cook/bake gluten free and have recently found my baking groove, so I seriously am excited to try these! Maybe even make for Santa’s visit! It took me awhile to figure out the whole gluten free baking thing. My first attempts were BAD. These are not bad. These are really good. Can’t even tell they are gf. These look amazing. Can’t wait to try them. Anything with chocolate and caramel calls my name! It’s funny I think this combo must be so vocal because it calls my name too! Yum!! Salted caramel wins me over every time! Oh my goodness. Get in my belly right now!! These look so delicious! I love the look of these. I may try to make them when no one is home and tell them later that they are gluten free. If I say gluten free before hand, everyone in my house they flip first. wow! These look totally decadent! I am defo making these! MM Delicious! I soooo need these in my life!! Oh my gosh that recipe looks incredible! Wow! I don’t think I’ve ever seen something gluten free look so delicious. Pinned and shared with friends. Yum! This looks so good. Might have to try making this one this year! I saw these pop up in my Facebook feed and pinned immediately! These look AMAZING! Mmm, this looks so delicious!! You’re making me want to lick my screen haha! Pinning for later! Whoa! Your bars looks amazing. Must make this soon! This looks absolutely amazing! I can’t believe its a gluten free treat! These look really delicious! When I was getting ready to make these I noticed it says “? half and half”. How much half and half do you use? Thanks for the recipe! 1/3 cup Patricia! I can’t believe I didn’t catch that typo. Thank you for pointing it out! Gosh, do I love the holidays. Family time and a strict diet of desserts, desserts and more desserts. Speaking of which, these look SO good! The caramel and chocolate had me from the start! These look super delicious! I can’t believe they are gluten free! 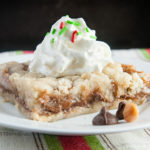 This looks like such an amazing dessert recipe, something I think my kids would love! I love caramel so I know I will like it! Thank you for sharing! Oh my goodness, these look amazing! I’m so making these for Christmas! How delicious do these look?! I’m all about anything salted caramel!